Due to personal business requirements, I travel a lot-, especially to the North-East region. And somehow along the time, I got acquired to their food habits. The strange spice mix- exotic vegetables. rare meats started taking on my taste-buds. And till date, I believe, northeastern cuisine is one of the most underrated cuisines in India (mostly because of the rarity of ingredients) and more so for the cooking style. 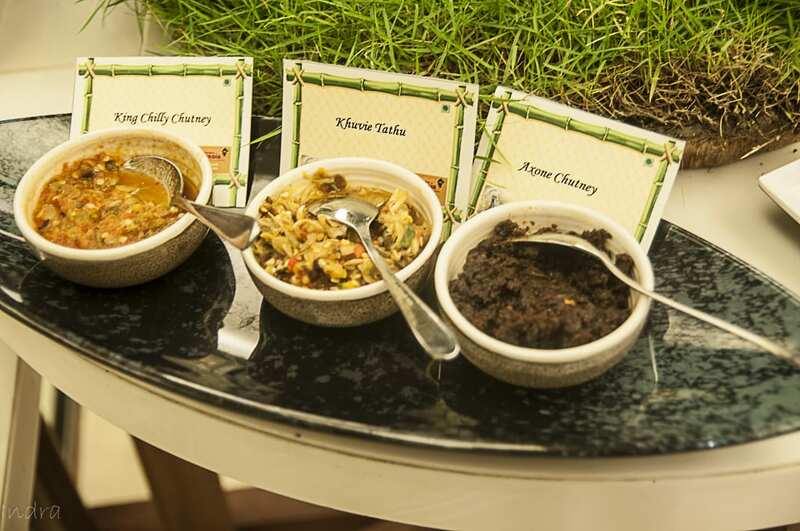 So, when this food tasting invitation came from ITC Sonar Kolkata as a part of the Kolkata Food Bloggers, I was more than happy to attend it, And boy, it was one hell of an evening. The festival is held in their coffee shop, Eden Pavillion as part of their dinner buffet. The buffet is priced at 1850/-+ Tax and included a huge spread (as per the ITC standard) and tucked at the right-hand corner, was these dishes. They thankfully didn’t try to do everything at one shot and seemingly attended 2 states per day. The day we went, was for Nagaland and Assam. We started with Thukpa. There were 2 varieties- veg and non-veg. 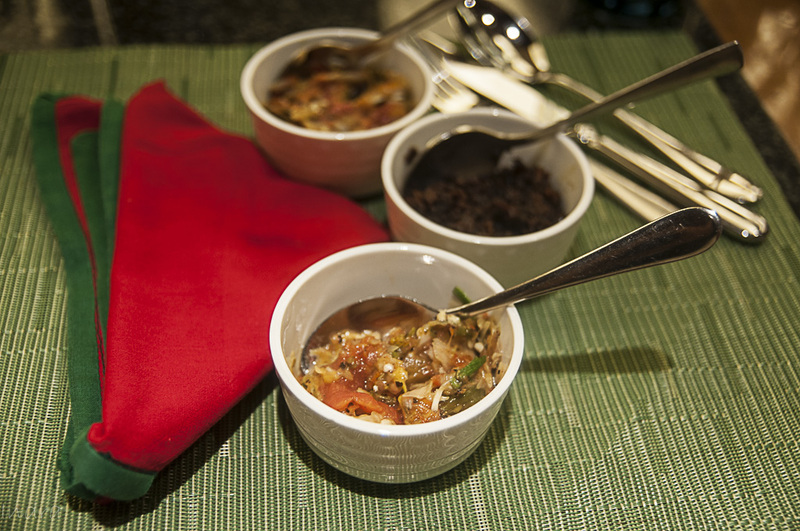 Surprisingly, the stock was kept separate and noodles, coriander, chilly flakes etc were kept separate and we were supposed to add it DIY style. The smell of freshly chopped coriander was great, but the stock could have been a little warmer. Overall, good (blue poppy spoiled us in this matter). At the table, we were served 3 types of condiments. 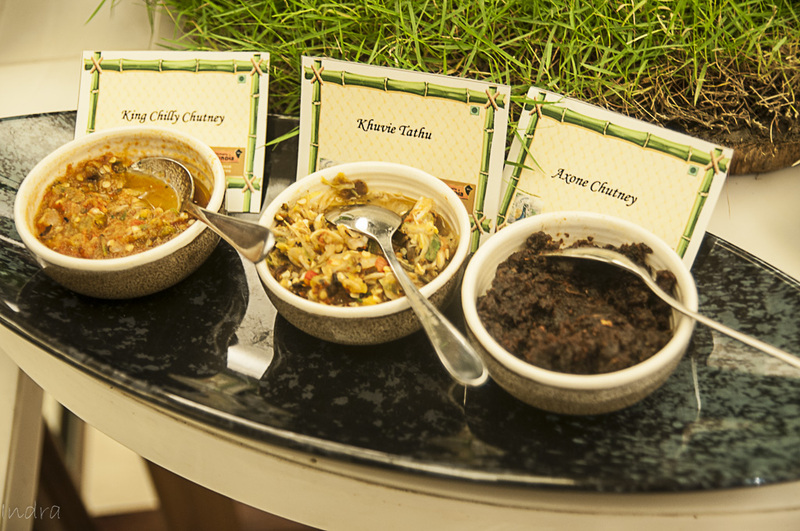 One was the king chilly chutney (they were supposed to use Bhut Jolokia, but the taste is subdued as per the levels of the mortal souls), Axone Chutney (which is dried and fermented soyabean) and khuvie tathu (which seemingly was a little spicy melange of chopped vegetables- which I couldn’t figure out). As usual, Axone was the king of the show. After this, frankly, we didn’t opt for the regular buffet items, so can not comment on it and hence, the remaining post will feature only the experience of these north-east regional dishes from the buffet. It was frankly a pretty decent spread and we started from the sticky rice with the mogumah dal and pitika. 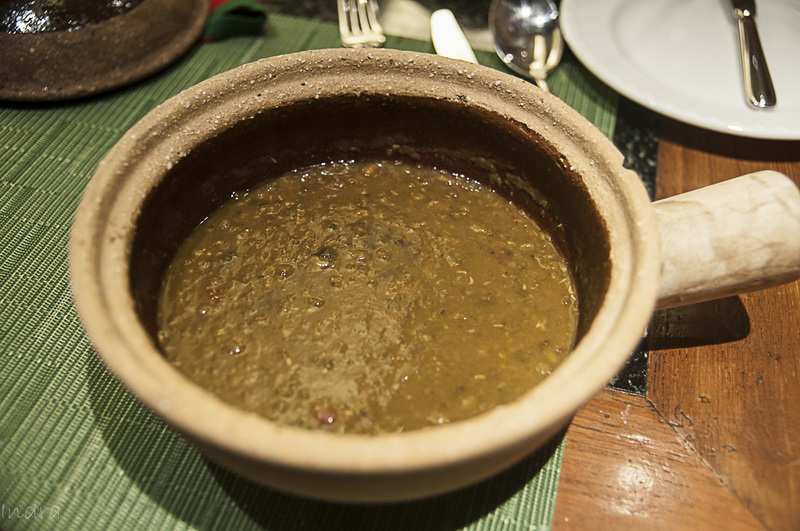 The Mogumah dal is an Assamese staple everyday dish. Basically, mixed lentil is cooked with typical spices (I’ve tasted this often with even duck/ pigeon meats in Assam, but that’s another story). 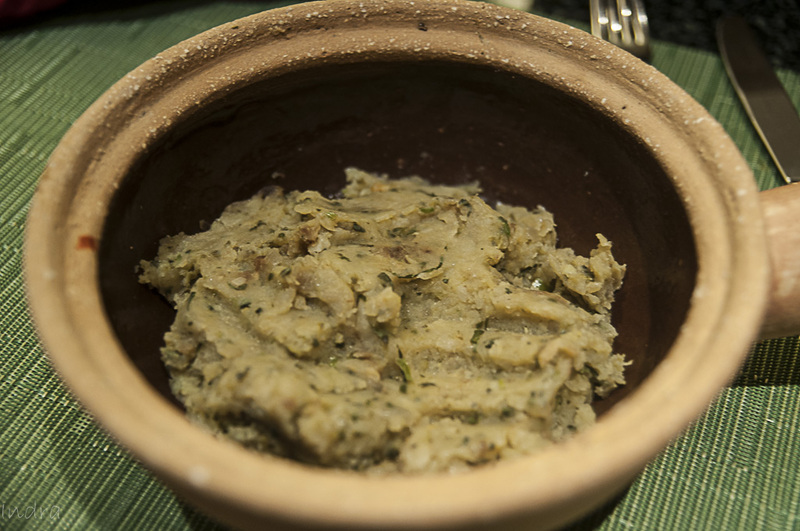 Pitika is typical Aloo bharta with mustard oil and coriander leaves, seasoned with crushed cumin and dhania. Immediately after which, we attacked the smoked pork with axone. Its called Awoshi Kipki Ngo Axone. 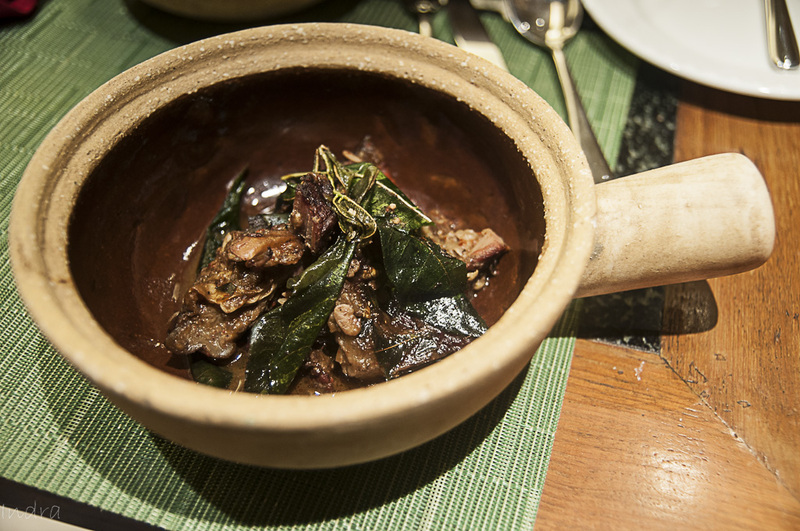 The pork is smoked carefully (over-smoked- and you get rubbery meat, undercooked, you get underdone meat) and seasoned with this fermented soya bean and a tinge of perilla leaves. The taste is extremely good, only if you’re familiar with it. The typical aroma of axone is the make-or-break-factor here. However, I loved it- simply. It was the same case with the next item- Roasted perilla chicken curry. It is a very regular chicken curry (little sour in nature flavored with perilla). 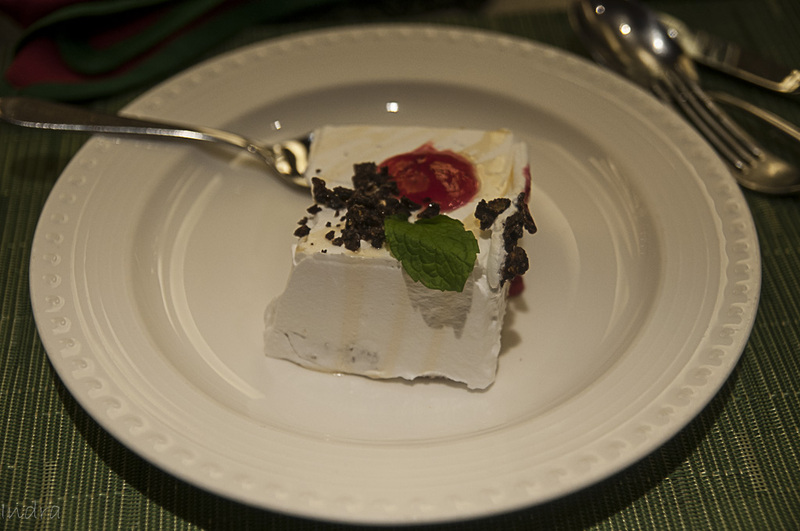 Perilla is a variety of mint, mostly available in the region and judging by its freshness, seemed to us that the chef carried the same with him. The dish was good. Mandatorily, for Assamese cuisine, one fish dish was there. It was Mahorbortenga. 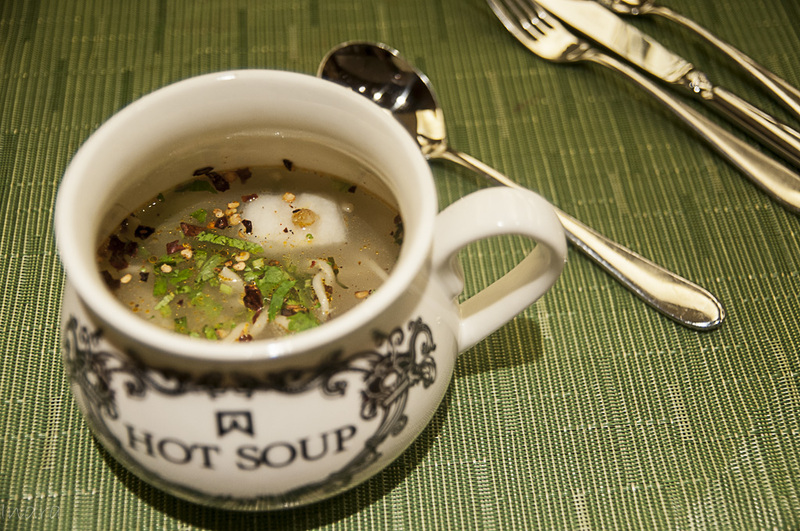 In layman’s language, basically, chunks of fresh water betki in a slightly sour gravy. The fish quality was top-notch and the dish went well. Next was another big player. 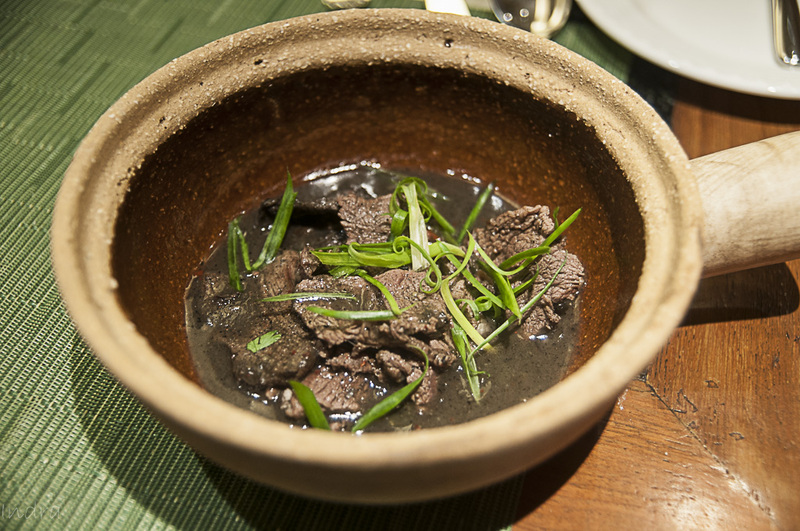 The tenderloin with black sesame. 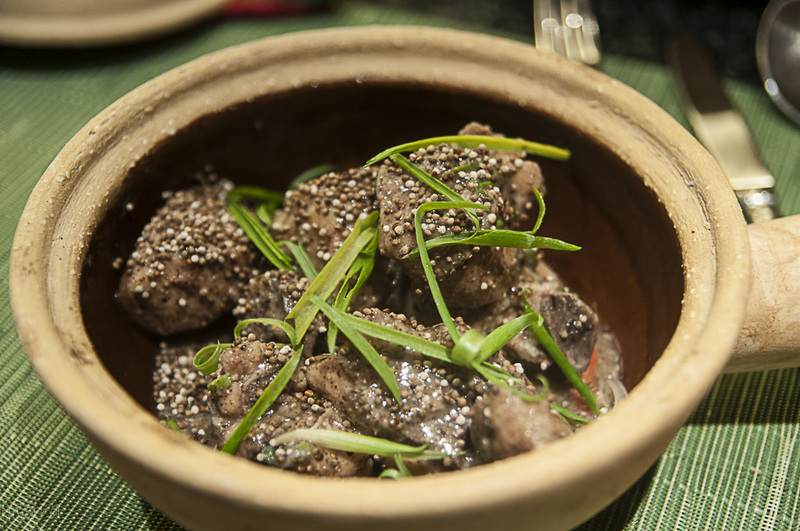 The tenderloin is sliced finely and cooked in the black pepper and sesame flavored spicy thin gravy. With plain rice, it was just brilliant- but definitely not for the weak ones. After we finished up all of these, we found out that there is one veg dish, which we missed out. Its called Dhokaanja. Its basically a north-east version of our Bengali dhokar dalna (masoor dal dumpling cooked in sou watery gravy- not much spicy). Well, we were full. But being a good Indian, skipping desserts is a sin. 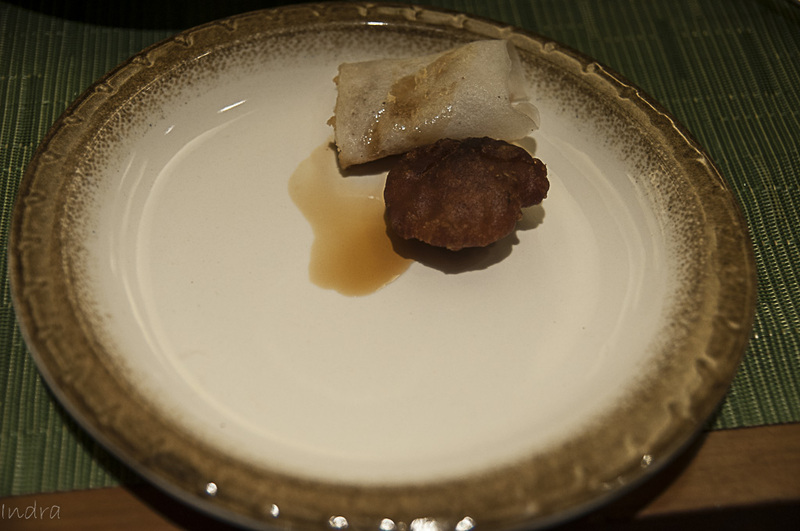 And, we were presented 2 types of pitha (sweet dumplings with honey and liquid jaggery) and one sticky rice gateaux. The pithas were ok-ish types but the gateaux with the thick layer of whipped cream on top was amazing. Well, it’s over and now some useful information. This dinner spread is in addition to the generic everyday dinner buffet which again is a battle on its own (due to the sheer size and variety) and ongoing till 27th September 2015. Considering we hardly get to eat authentic north-east dishes here, it’s damn impressive, hence rush. Cheers and Bon appetite !!! The description is wrong . 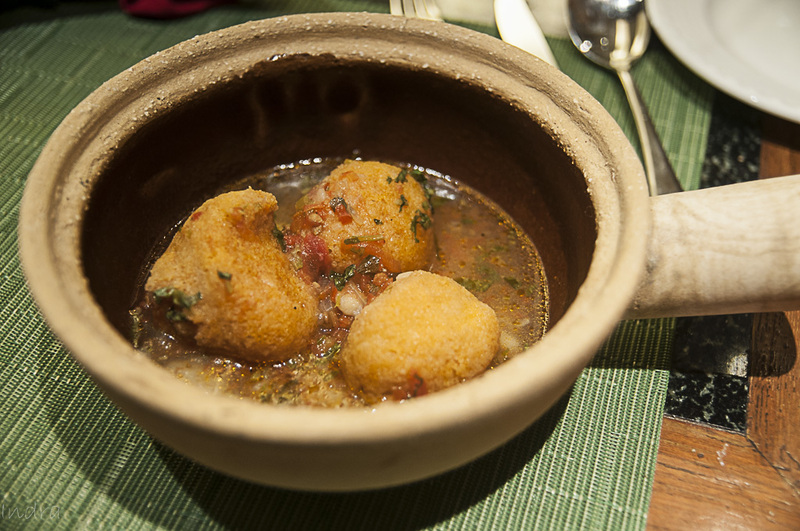 Mahabortenga is lentil fritters and a vegetarian dish . And the pork dish with light curry?? The writer has no knowledge of what he or she ate . Thanks for going through and pointing out. 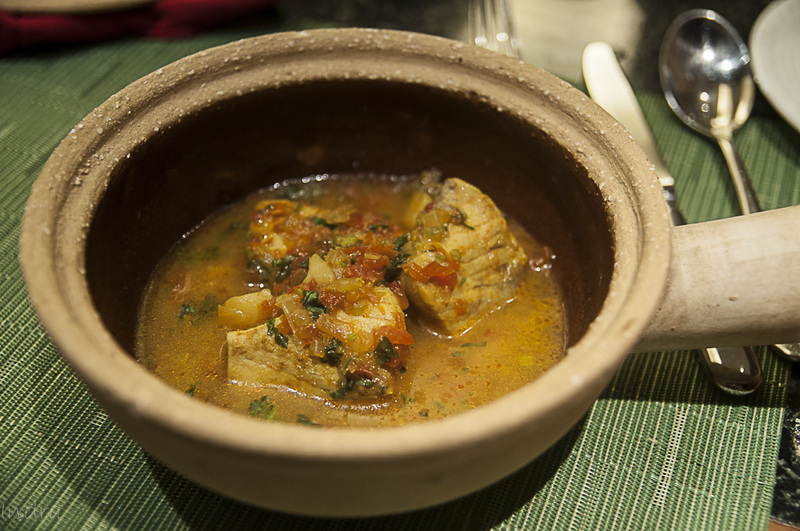 But, we were told by ITC Sonar that Moharbortenga is a fish dish cooked in sour gravy (I’ve got pictorial evidence for the same). And, pork dish with light curry ? where did I write it even ? Indrajit Lahiri! you had been given wrong information . Bor means fritter and lentil fritter as fish ?? Also We do not use bhetki fish for tenga dish. Also there is no such dish named as Dhoka anja . Dhoka is absolutely a bengali dish . Thanks once again. But, we were guided by ITC menu tags for the item names. That’s why took all the photographs…..